Power cuts in south east Anglesey could be caused by cows scratching themselves on equipment, an electricity company has told its customers. Homes in Llanddona have been suffering intermittent problems affecting supply for a few seconds at a time. Councillor Carwyn Jones said the long-running cuts were enough to knock out computers and other equipment. ScottishPower said a broken support for an electricity pole had now been repaired. "For years now the electricity has been going off for a few seconds then coming back on," said Mr Jones, county councillor for Seiriol ward, which includes Llanddona. "I contacted ScottishPower and they got back to me saying they thought it was cows scratching against equipment, leading to a temporary cut as the equipment is moved. "They said they were going to install fencing around the poles to try and sort it out, but as far as I know that has not happened yet." He added it was a "bit much" to blame the cows. "A company like this, which makes so much money, should invest in new equipment," he added. "It's not right in this day and age that people have to suffer this as it affects everything from computers to televisions and cookers." A spokesperson for the supplier said: "ScottishPower apologises for the inconvenience these short interruptions have caused. "The latest interruption was due to a broken stay which supports our poles. "The repair has now been carried out and a fence has been placed around the stays to alleviate this problem and prevent this from happening again." 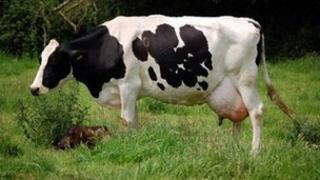 It is not the first time cows have affected electricity supplies to customers of the company in north and mid Wales. In September last year ScottishPower said three separate faults had caused interruptions to 80 properties in Forden, near Welshpool. Cows rubbing themselves on strain wires from a pole, and birds gathering on top of another pole had caused problems, it said.